The Arabs, along with everyone from the Chinese to the Gypsies all believed that sage was the key to a long life. This is the same sage that in most modern households gathers dust for most of the year, only to be brought out in the fall to season the Thanksgiving dinner, usually used with too heavy a hand, explaining its unpopularity with cooks during the rest of the year. Sage is one those extraordinary, ordinary herbs whose longstanding and familiar use leads us to greatly underestimate it. The uses of sage outside of the kitchen range from the mundane to the mystical, from a cure for the common cold to the psychoactive effects of Salvia divinorum and Salvia apiana in ceremonial and religious celebrations. Preparation Methods & Dosage :Sage can be used fresh or dried both as a culinary herb and medicinal herb. Sage can be taken as a tea, and the infusion can used externally as a skin and hair rinse, and as a gargle for sore throats. Liquid extracts can be diluted with water and easily applied to teeth and gums. 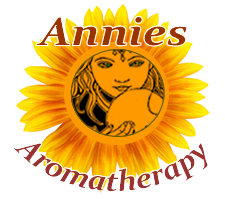 The essential oil is used sparely, and is never ingested. White sage is burned as incense in Native American ceremonies. 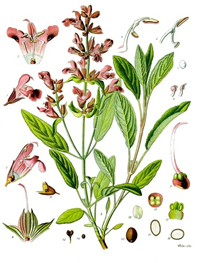 Sage oil is occasionally used in perfumery in herb-type, spicy, and masculine scents. The undiluted essential oil can cause skin irritations and should never be taken internally. The Chinese have long valued sage for its healing properties. Red sage or dan-shen Salvia miltiorrhiza is one of many Chinese species in the genus, and is a very commonly used in traditional Chinese herbal medicine to relieve pain after childbirth and regulate menstruation. Combined with dan-gui, it is used to regulate suppressed menstrual flow. Sage is a shrubby perennial herb of the mint family native to the Mediterranean. There are over 500 varieties of sage, and most are medicinally useful. They grow throughout the tropical and temperate zones and many of them have medicinal and culinary value. Of the hundreds of species of sage, only a handful are used in cooking. Culinary varieties include golden garden sage, dwarf garden sage, and the sweet pineapple sage. There are over 900 salvia species, about 80 or so are cultivated for ornamental or medicinal purposes. You could devote an entire garden to this amazing plant. Most sages are tender, shrubby, perennials found growing in dry, temperate climates worldwide. My favorites include Salvia officinalis , common garden sage, S. elegans, Scarlet Pineapple, and S. sclarea, Clary Sage. Pineapple Sage or Tangerine Sage is one of the best tasting cultivars for teas and use in cooking. The bright red flowers bloom in the fall in my area of the Southern US, and form a beautiful contrast with the green leaves. The flowers attract hummingbirds, butterflies and other pollinators to your garden. 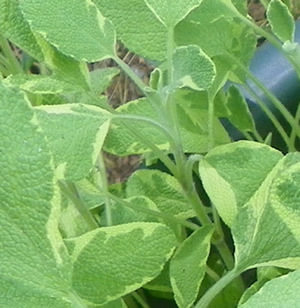 Golden Pineapple sage has lighter-yellow colored leaves. Pineapple sage is a traditional medicinal herb in Mexico where it blooms year round. also known as Diviner's Sage, Sage of the Seers, or simply by the genus name, Salvia, is known as the most psychoactive of the salvias. Chia seeds have been used as a medicinal food for centuries, but most Americans may know them best as the 1980's phenom "Chia Pet" planters. The seeds of Salvia hispanica are very rich in Omega-3 fatty acids, and are the richest vegetable source of ALA. Today Chia is being aggressively marketed as an "Ancient Aztec Superfood" under the trademark Salba, and sold for up to $6o per pound. You can however, enjoy the many health benefits of organically grown chia seed for as little as $9 per pound through reputable health food suppliers. White ceremonial sage: Native Americans used sage in smudge pots for ceremonial incense. In addition, white sage was used to treat coughs and colds, as a general tonic and fever reliever. Salvia, is from the Latin salvare, to save, or to be well. Sage was a sacred ceremonial herb of the Romans and was associated with immortality, and was also said to increase mental capacity. The Greek Theophrastus classified sage as a "coronary herbe", because it flushed disease from the body, easing any undue strain on the heart. In the middle ages, people drank sage tea to treat colds, fevers, liver trouble, epilepsy, memory loss and many other common ailments. Sage was held to be a major medical herb by the French, because of it's anti-bacterial properties. Sage has also been used as a beauty aid. Early Greeks drank, applied or bathed in sage tea. Turkish women used sage as a natural hair dye for gray hair, and it still recommended for use in dark hair. There is an old Arab belief that if your sage grows well you will live a long time. During the fourteenth century, three leaves a day were to be eaten to avoid the 'evil aire'. Sage was also a favorite of the Hungarian gypsies, they believed that it attracted good and dispelled evil. Chia, Salvia hispanica was referred to as "Indian Running Food" by the Apache and Aztec warriors who sustained themselves while on conquests and hunting.